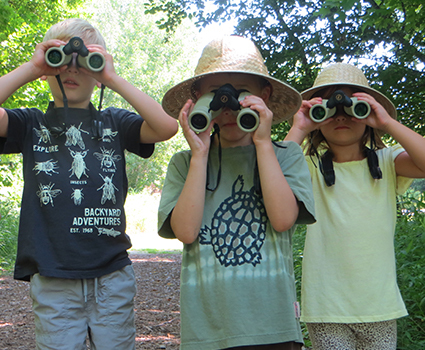 One of the summer camp choices at Maywood is our six week parent and child camp entitled, “Little Hand Nature Explorers”. This six week experience is specifically designed to introduce you and your child to our programs and our nature based philosophies. You and your child will learn about nature while also learning about the importance of play in nature and how it leads to healthy childhood development. This program is led by our professional environmental education staff, who will lead the activities and guide your child’s wonder and curiosity through inquiry based learning. Other than severe weather, this program is 100% outside, rain or shine; so dress to get messy. This is the ONLY camp we offer that allows the parent to be a part of the experience. It’s a wonderful way to explore with your child and introduce them to, not only the wonders of nature, but the other experiences that await them. There is a limit of 12 children per day. The fee is for the parent and child, in addition the fee is per 6-week session. This camp is hosted at Maywood Environmental Park, which is located at 3615 Mueller Road, Sheboygan, WI 53083.